Students observe yeast making carbon dioxide as it metabolizes (eats and breaks down) sugar. We will set up an activity to see what happens when yeast eats sugar. Put a scoop of yeast and a scoop of sugar in at tube, then add warm water to half way up the tube. Take a wooden stick and stir until the yeast and sugar have dissolved in the water. (What does that mean: solid to liquid). Then put the tube in the tray on your desk. We will leave the yeast for a while while we talk about what is happening in the tube. The yeast is a living thing. It is dry or dormant in the jar, not doing anything. It can stay like that for a long time. When you add it to water and food it starts to eat. The yeast eats the sugar you added to the tube. The yeast in the starter mixture of a yeast cake also eats sugar. Yeast eats the sugar and breaks it down into carbon dioxide and ethanol. Carbon dioxide - is it a gas, liquid or solid? It is a gas. We breathe it out. Yeast also breathes it out. Your yeast should have activated by now and be making ethanol and carbon dioxide gas. What might the gas look like? Hold your tube to the side and look for bubbles going up the side of the tube. Optional: use a flashlight to help find the bubbles. These are bubbles of carbon dioxide gas, made by the yeast as it eats the sugar you put in the tube. You might also see bubbles collecting at the top, making a kind of foam. Some of the tubes may even be spilling bubbles of gas over the top. 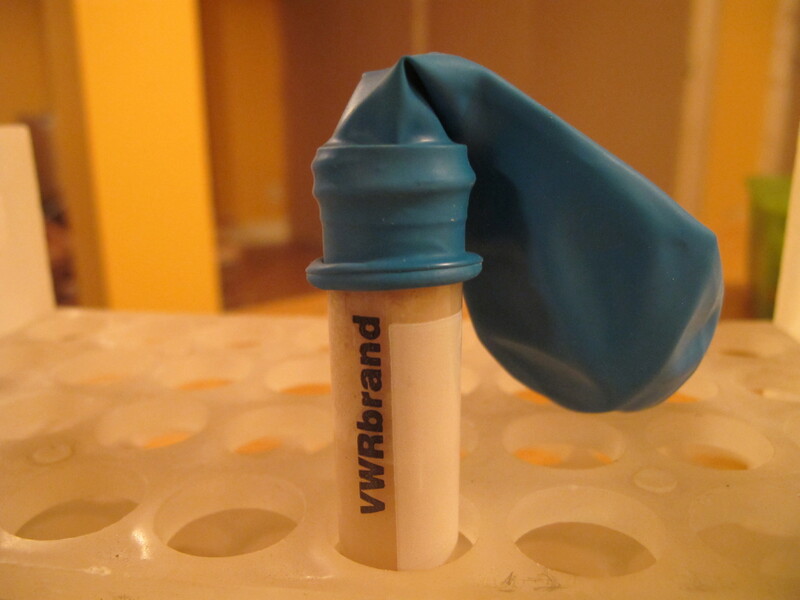 Optional: put a balloon over the tube, to collect the carbon dioxide gas and blow up the balloon.